2014 blessed us with an onion harvest like I have never seen before. Red, yellow and white onions were hauled out of the garden by the bucketful to fill the shelves of the root cellar. The white onions, a Vidalia type, were so sweet that when my sister visited at Thanksgiving, she said they were the first garden onion she'd consider eating like an apple. While nearly every savory dish we enjoy includes onions in one form or another, I wanted to add some new onion focused recipes to the menu. I started digging through my favorite veggie focused cookbooks, and came across a recipe for onion pudding in “Too Many Tomatoes, Squash, Beans, and Other Good Things: A Cookbook for When Your Garden Explodes“. What's onion pudding? Think rich and creamy onions with a hint of cheesy goodness. The high oven temp gives a bit of a crispy edge while leaving a smooth center. It's a wonderful side dish with any meat, and a great complement to a salad or other fresh veggie dish. To make the most of this dish, I highly recommend taking the time to grate your Parmesan cheese fresh. The flavor and texture is so much better than the green can product with wood pulp added to prevent caking. And since Parmesan is a hard cheese, it lasts a really long time in the fridge, especially if you vacuum seal any leftover chunks. I usually bake mine in a nine inch glass pie plate, which makes 8 slices. 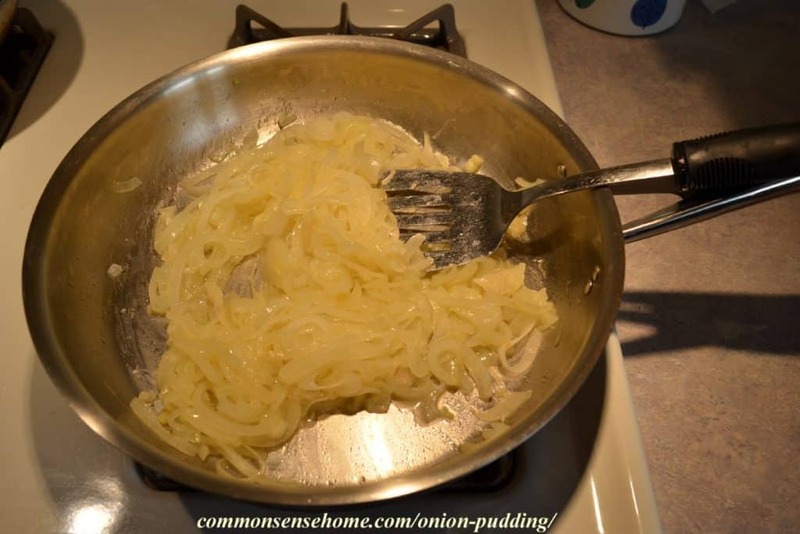 In a large skillet, cook onions and butter over low heat about 30 minutes, until translucent. Do not brown. Sauteed onions ready to mix and put in the oven. In a medium mixing bowl, whisk together cheese, flour, eggs, milk, salt and pepper until smooth. Stir in onions. Pour onion mixture into a buttered gratin dish or 9 inch pie plate and bake 20 minutes at 400F, until edges are lightly browned and center is set. Serve warm. A note on grating the cheese. My friend, Julie, bought me an OXO Good Grips Box Grater (shown below) for Christmas a few years ago. I love that thing! The grip on top makes it easy to hold on to, and it has wider shred size on one wide surface, fine shreds on the other other wide surface (which we like to use for the onion pudding), a slicer on one narrow side and a zester on the other narrow side. There's a clear measuring box that fits on the bottom so you don't even have to dig out a measuring cup. It's become one of my most used kitchen gadgets. The boys scramble to get their portions at suppertime. 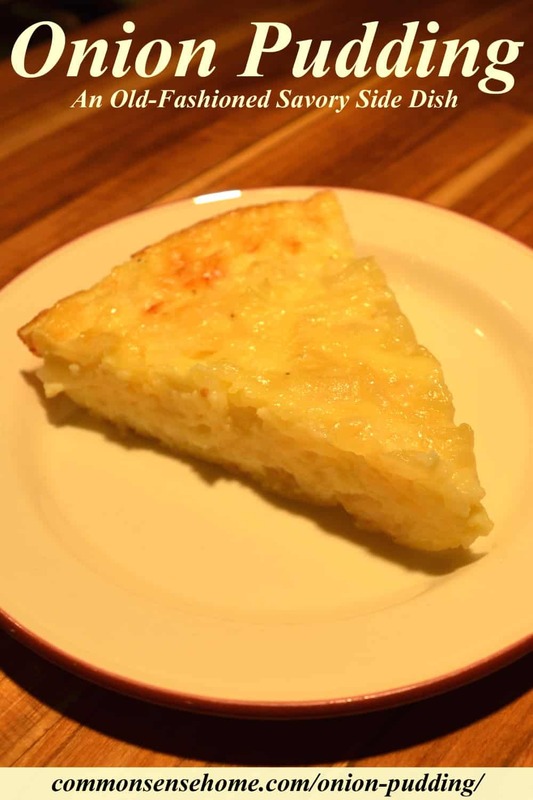 Onion pudding (or some might call this onion pie) tastes like the savory flavor of cooked onions that goes so great on a burger, but the cheese and eggs make it substantial enough to stand on its own. If there are any leftovers, keep them in the refrigerator. It's not bad cold, but tastes better reheats in a fry pan, toaster oven or microwave. It's become one of our favorite new onion recipes. In a medium mixing bowl, whisk together cheese, flour, eggs, milk, salt and pepper until smooth. Stir in onions. Pour onion mixture into a buttered gratin dish or 9 inch pie plate and bake 20 minutes at 400F, until edges are lightly browned and center is set. Serve warm. Powdered cellulose is an effective anti-caking agent when applied on the cheese at a rate of 0.75-1.5%. Levels higher than 1.5% can be used, but increased visibility of the cellulose on the cheese at those levels can have a negative consumer perception. The anti-caking agent can also be an effective means of dosing anti-mycotics onto the cheese to extend shelf life. In the past, sorbates, propionates and oxygen scavenger blends have all been used to extend the shelf life of shredded cheese. Today the preferred preservative technique is the use of Natamycin combined with modified atmosphere packaging. “Anti-mycotics” are mold preventers. Natamycin, when prescribed to treat fungal infections, has been linked to the side effects of: allergic reaction, chest pain, discomfort, edema, irritation, pain, foreign body sensation, and more. Prescription strength is likely to be much stronger than cheese strength (5% instead of 20 ppm), but it may still effect sensitive individuals. Grating cheese only as needed and vacuum sealing and/or freezing for longer shelf life will help prevent mold without anti-fungal agents. Yummy.. This onion pudding sounds really good. Well my grandma used to make it on weekends when we were kids. This will be the first time when i am gonna prepare it on my own. My favorite way to use up onions is what my kids call onion sandwiches. I fry a skillet full of onions in a little butter until tender, then stir in 1 pound of the cheapest deli roast beef shaved thin. When everything is hot top with a layer of provolone cheese turn off the heat and put on a lid so the cheese melts. Spread butter on the cut side of sandwich buns and brown. Add the meat and onion mix -quick easy and yum! slow cooker brisket & onions! This looks like a very tasty dish. Can’t wait to try it!!! I’ve never tried that, but maybe I should. What’s it like? Onion Jam is great with a wedge of cheese e.g. in a ploughman’s lunch or used for any purpose where you would ordinarily eat relish or chutney or Branston pickle etc. It’s also lovely with a pork or lamb chop etc. 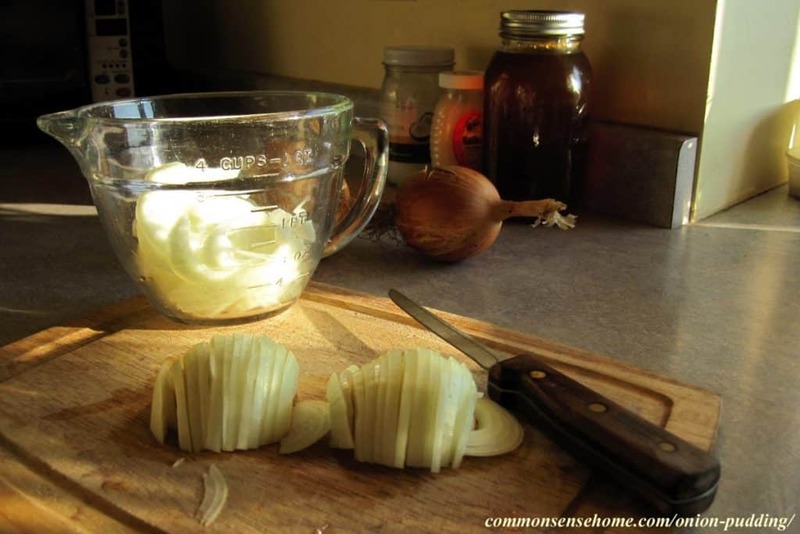 It is a great way of using up a mammoth amount of onions because the onions cook down to a tiny fraction of their original volume. Cook an insane amount of sliced onions over a slow heat for about 2 hours in just enough butter (or olive oil if you prefer) to prevent them sticking. Slow cooking caramelises them but also allows them to slowly release their water so if you’re careful both the browning and the watering will balance each other out and they will not stick or burn. Instead, you can just pop in and out of the kitchen every now and then to give them a stir. After about an hour, add some fresh thyme leaves (I can’t really give an amount except to say: a small bunch. Also I’ve never tried it with dried thyme so I can’t say whether that would be any good). Then when the two hours is almost up, add just a small amount of brown sugar (no more than one or two tablespoons for what started out as a huge pot of onions) and the same amount of balsamic vinegar (apple cider or wine vinegar is also okay). When it comes to the sugar and vinegar, add only a little and taste it before adding any more. When it cools down, see if it needs maybe just a tiny little bit of salt. Anyway, let it go cold because that’s how its meant to be eaten (or at least at room temperature) and it just doesn’t taste right while it’s hot. Also, I am writing from Australia and I’m not sure what country you’re in but in Oz, brown sugar is a very dark, dense, moist and very “molassassey” sugar. Nothing like golden crystals of sugar or those light brown coffee crystals. Perhaps you have the same type of sugar wherever you are. Anyway, onion jam is very, very good. I receive compliments every time I make it and am always asked for the recipe. I love onions so I am also going to try your onion pudding. It looks and sounds great. I can also recommend French onion soup. Look up an authentic recipe on the internet. While it doesn’t need a splash of sherry like some recipes say, I do insist that it’s no good without gruyere or emmenthaler cheese melted on a big crouton and floated on the top of it. If you’re keen on more onion recipes, look up pissaladier. It is a provencale dish a bit like italian pizza but only ever has lots of onion on top together with black olives and anchovies. And unlike pizza it has no cheese! We have light and dark brown sugar that are just refined white sugar with more or less molasses added back in, but I also have access to sucanat, which is truly less refined sugar, and maple sugar, which might also be lovely in this recipe. The jam may end up being a project one of these cold winter days. One pot on the stove for bone broth, one for onions, and the kitchen would smell amazing! The onion jam sounds delightful. May I ask how long it keeps in the refrigerator? I’d suspect it would last about a week, maybe two? Sugar and vinegar are preservatives, but it doesn’t have a ton of either. lol – sometimes more is more, right? 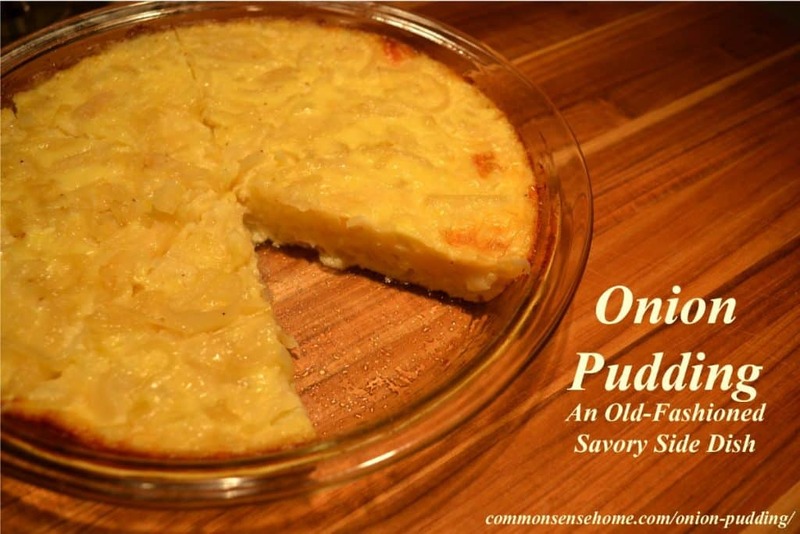 Oh no, you must call it onion pudding because it sounds like old fashioned british nursery food. I’ve read that in the UK, at the end of the meal they used to have a course called the Savoury. Even though Savoury is usually an adjective, in that case it was used as a noun. And judging from your onion pudding recipe, it is exactly the kind of thing that they would have served as the last course before the ladies retired and the men drank their port. That’s what I was thinking, too. 🙂 No one does savory pudding in our area, but I like it! PS I must compliment you on your great website. I came across it by accident when I did a google search for whether its true that some manufacturers put wood pulp in parmesan cheese. Anyway, I am not a homesteader but I like to cook everything from scratch when possible. I dropped out of the workforce six months ago to become a full time carer for my mum who is 82 and needs 24 hour care. To keep sane I write and make art work from home and also am learning to cook things I didn’t previously know. So far, I have made all kinds of bread and brioche and hot cross buns for the first time, perfected pizza dough (which I have been making badly for many years but have now perfected) and even learned how to make English muffins. I’m not any kind of health freak or anything but when I read the ingredients list on the wholemeal muffins from the supermarket, I was shocked at how much unnecessary crap they contained. I also learned how to preserve olives for the first time this year (using stolen olives I foraged from the public parklands around my city) and how to make sauerkraut. Here’s a funny anecdote: because I live in Adelaide, when the top temperature hits 38 degrees celcius (which it has already done for six days this although we are only in the first month of summer) I make yoghurt in the ambient temperature on the kitchen bench. Its because I’m too lazy to muck around with a thermos or other incubation systems and I prefer to set it directly in pretty little glass pots anyway. So, because of my laziness, I only make yoghurt when its boiling hot! Anyway, I’m inspired by the idea of homesteading. I will definitely take some tips from your site. Good luck with your endeavours. It sounds like you are doing brilliantly! Thanks for your kind words. Homesteading is not just about having property, it’s about the mindset of doing more for yourself. Label reading and learning how to cook real food is a great first step to increasing your self-reliance. The yogurt story isn’t lazy, it’s practical. 🙂 I love recipes and projects that involve minimal fuss. Wow this sounds amazing! It inspires me. Have you tried it with cheddar cheese? My family goes nuts for cheddar. Personally I am not much of a cheese eater, but I think I would eat this! I will have to test with other cheese just for fun! I’m sure cheddar would work just fine. I’d personally prefer a well aged cheddar, because it has a stronger flavor and more crumbly texture. Mild cheddar would, I suspect, just not give that same punch. You could do a half batch and bake it in a loaf pan. My youngest likes to grate cheese, so he handles it most of the time, but I’ve gotten much less prone to losing knuckle skin over the years. I really like the box grater. Very user friendly. Just came across this and want to try it. What type of onion works best in this recipe? Whatever type of onion you have on hand. 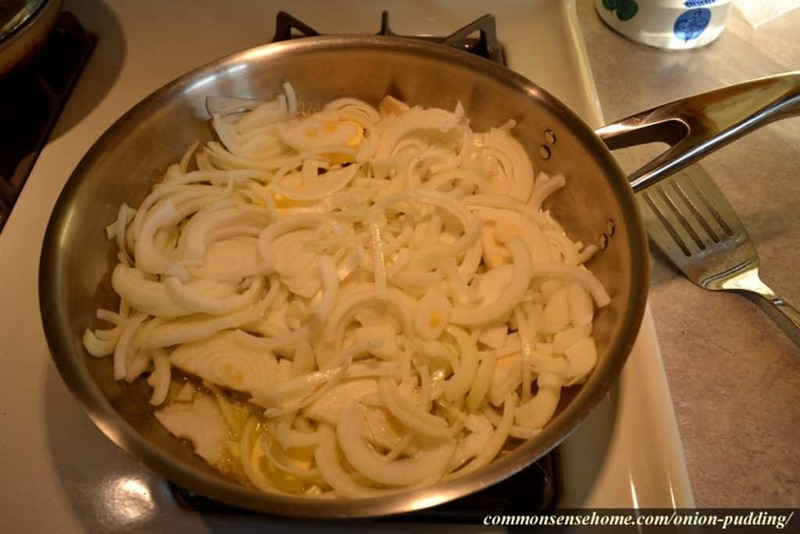 I’ve used sweet onions, red onions, strong flavored yellow onions – all turned out tasty. The key is the slow cooking of the onions before they go into the mix with the cheese, etc. This adds a depth of flavor that pulls the whole dish together. Wonderful! Thanks for the quick reply. I’m excited to try this recipe out!